The long awaited trip to the northwest was finally made. Several goals were motivation for the trek. To visit Oregon where some ancestors had pioneered, the addition of solar power to Tardis, and seeing Glacier National Park were among them. Along the way were many other noteworthy places. The first week in April, I headed out from New Mexico with a couple of places on the way that I wanted to see before leaving the state. Gila Cliff Dwellings, Silver City art galleries, and the Catwalk were on my list. 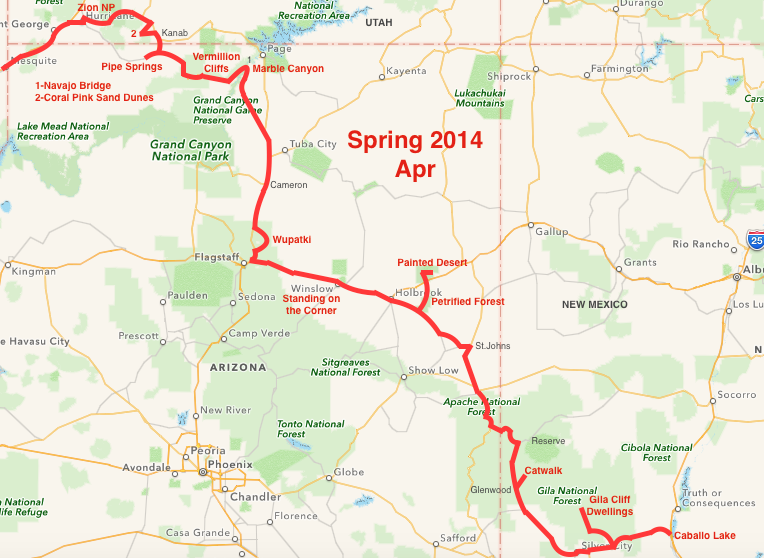 Then it was on through northeast Arizona for a few more historic and notable stops. Among them were the Petrified Forest and Painted Desert, Wupatki pueblo ruins, and the Vermillion Cliffs. Plans were to camp on the north rim of the Grand Canyon. But, it was still snowed-in and not yet open when I was passing. A short jog into the southwest corner of Utah took me on an eagerly anticipated visit to Zion National Park. Wow! Visits to Valley of Fire State Park, Lake Mead, Red Rock Canyon, and Death Valley National Park. And along the way, the wonderful Amargosa Opera House, and an aborted stop at the Alabama Hills. Stops at Crowley Lake to spend time with an RVer friend, Mono Lake to see the tufas, Lake Tahoe, and Lassen Volcanic National Park. 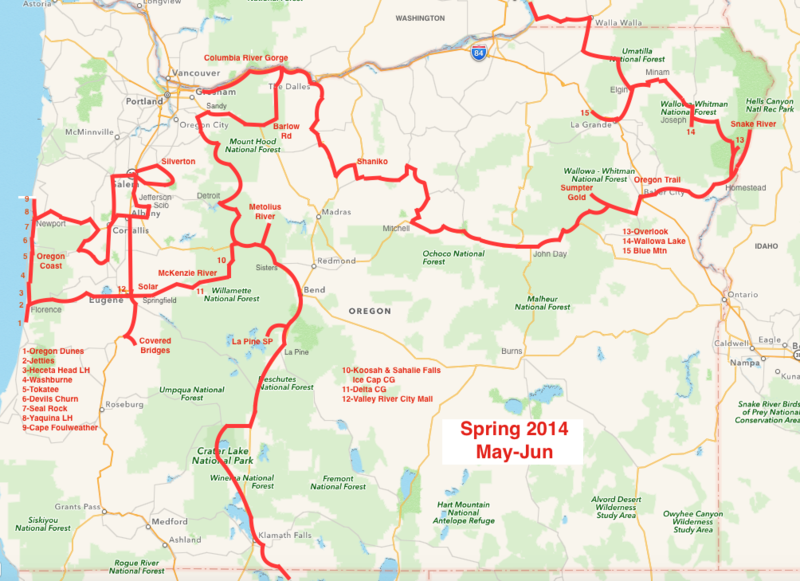 Then on into Oregon by the last week of May. First stop was at Crater Lake National Park where there was still mountains of snow. On to meet up with an RV friend by the Metolius River. Over the Cascade Mountains with waterfalls along the McKenzie River, a Solar Install, the Oregon Coast, Covered Bridges, the Columbia River Gorge with multiple waterfalls, the Oregon Trail with stops at family points and meeting a cousin, and Hells Canyon.